I'll be perfectly honest with you, I initially judged this book by its cover. 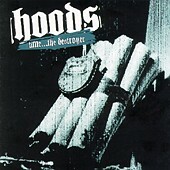 With a name like HOODS and a nationwide reputation as one of the hardest hitting metalcore bands in existence I jumped to the conclusion that HOODS were one of the many bands more interested in tough-guy histrionics than music. After hearing "Time...the Destroyer" I realized I was totally off base. I would definitely agree that HOODS have earned their reputation as a monstrously heavy metalcore band who are going to blow you away with their power and conviction, however, lyrically there is none of the "head meet baseball bat" silliness I expected. Instead the songs mostly explore personal confusion, self doubt, and emotional desperation. There are a couple tunes that might be misconstrued as tough-guy posturing but with careful reading of the lyrics they it is obvious they are intelligently written outcries against society. I might even go so far as to call HOODS "mature" hatecore. I'm 100% impressed.